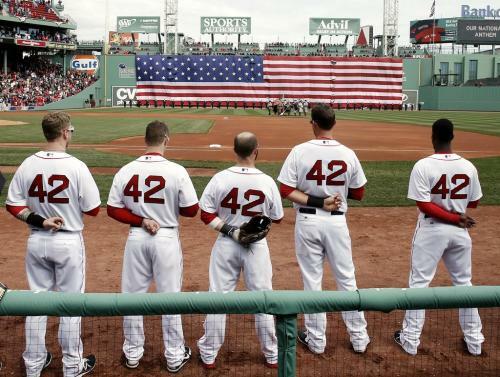 BOSTON -- "Everybody in uniform at the Tampa Bay Rays game Monday, April 15, 2013 against the Boston Red Sox at Fenway Park wore the number "42" as Major League Baseball celebrated its fifth annual Jackie Robinson Day". Because the nation and world rightly turned its attention to the terrorist attack in Boston on Monday afternoon, this story got put in the background. Major League baseball honored Jackie Robinson, the first black American allowed to play in the segregated major leagues when he started for the Brooklyn Dodgers at first base on April 15, 1947. This is the fifth [now seventh] such anniversary of Jackie Robinson Day commemorated at every major league ballpark in America. Jackie Robinson has to be regarded as one of the top Americans who influenced civil rights in our history, along with great figures like Rosa Parks, not just for being the first black man to play Major League Baseball, but for having to endure unspeakable acts of bigotry against him for daring to break the color barrier in baseball. He not only endured them, but he faced them down with courage and grace, in overcoming the bigots. And now Major League Baseball rightfully honors Jackie Robinson every April 15, as every major league baseball player wears Jackie Robinson's number 42. By the way that number has been retired for all of Major League Baseball in which no team member can ever wear that number again. Jackie Robinson is the only MLB player who has been honored in such a way. My wife and I went to see the movie 42 and I can report that this is a must see movie by every American. We thought it was a great moving movie that ended in applause by the entire theater and tears in many eyes [I know there were some in Sheralyn's and my eyes]. 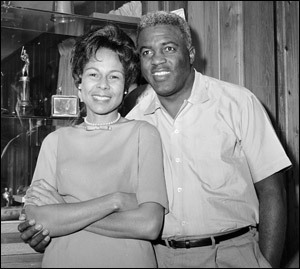 What is great is that Jackie Robinson's wife, the graceful Rachel Robinson is still living and getting to enjoy this celebration of her beloved Jackie. 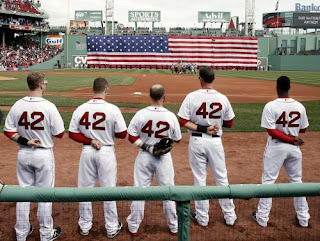 A TRUE hero # 42 was, a real man who stood up to racial abuse so all could some day have equality in opportunity. Can't wait to see the great movie--thanks for great post! You will love it brother. Thanks. I am incredibly appreciative that Mr. Robinson and so many others (black and white) were willing to make such sacrifices, including death, so that black people could have what was stated in the Declaration of Independence. We hold these truths to be self-evident, that all men are created equal, that they are endowed by their Creator with certain unalienable Rights, that among these are Life, Liberty and the pursuit of Happiness. Thanks Mr. Robinson for helping me live the dream! I wish that all political discourse could be just as harmonious as your commentary-nice.